Designed in Hackney: our pick of design talent in the London borough of Hackney today is East London Furniture, a company that makes all its products from scrap materials found in the local area surrounding its shop on Hoxton Street. 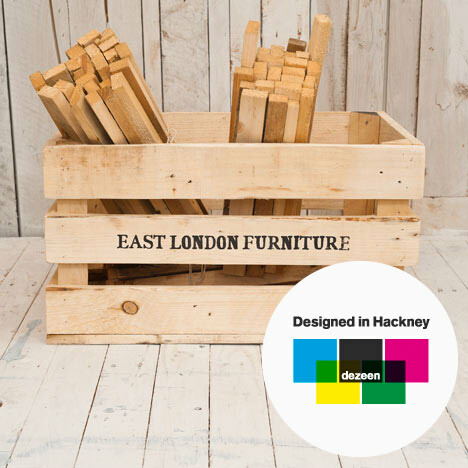 Dezeen first discovered East London Furniture when we were based in nearby Rivington Street for Dezeen Space. Everything is reclaimed and recycled in the workshop at the back, then displayed and sold in the shop at the front. Products include benches, lighting, stools and accessories, displayed on the website alongside a record of who made each piece and on what date. Going beyond the normal reclaimed timber yards, all materials used are salvaged from waste so that most materials used in the products have been diverted from landfill. East London Furniture was founded in 2011 and is run by Ben Green, Reuben Le Prevost and Christian Dillon. Since forming they have worked in a series of empty shops around east London on short-term, "meanwhile" leases. "So as well as materials we also upcycle property," says Dillon.